Laura is a PhD student at ETH Zürich in Switzerland. She is working on ambient noise source inversion with cross-correlation techniques. Her goal on the blog is to showcase PhD students' and young researchers' results, as well as recent seismological highlights. You can reach Laura at lermert att student.ethz.ch. Together with Jessica Starke (left), Solmaz demonstrates how a slinky can be used to model the behavior of compressional and shearing waves. Solmaz Mohajder is a researcher at the Earth System Dynamics Research group of University of Tübingen in Germany. She has published an online database and an interactive map for active faults in Central Asia (Mohajder et al., 2016). More recently, Solmaz and her colleagues have compiled fault slip rates to investigate whether deformation rates from GPS and from geologic observations provide consistent slip rate information at the orogen scale (Mohadjer et al., 2017). In 2016, Solmaz was awarded an EGU Public Engagement grant. The current call for applications for the EGU Public Engagement grant closes on February 15! See this page for more information. Recently, Solmaz has described her work for and with the Public Engagement Grant on GeoLog. We have taken the opportunity to ask her about factors that shaped her career so far. Please tell us about your research interests! My research focuses on quantifying natural hazards using a variety of different techniques such as GPS geodesy and terrestrial remote sensing (Lidar), and making research results available to those at risk through geohazards education and community outreach. In how many countries did you live/work up to now? How has living in many countries reshaped your way of doing research? I have stopped counting. I was born and raised in Iran and spent most of my life living in the US (Pacific Northwest) and Germany with one year in Tajikistan. I learned and embraced the culture of volunteerism, community outreach and education for the first time in the United States. As an undergrad at the University of Washington, I volunteered with the Pipeline Project as a science/math tutor in Seattle public schools, immigrant/refugee community centers and correctional facilities in my neighborhood. I then took my newly-discovered passion and skills for science, education and outreach to the University of Montana. I combined scientific research with science education and outreach as part of my Master program, for example working on an earthquake education curriculum for K-12 schools (Mohadjer et al., 2010) and on quantifying the deformation field in Central Asia (Mohadjer et al., 2010). But it wasn’t until I was asked questions by those I met in places like Pakistan and Tajikistan, particularly children, that I became aware of the importance of my research in practical life. Simple yet important questions such as “What is an earthquake?”, “How does it affect me?” or “What to do about them?” kept me up at night, and eventually shaped the way I’ve been doing research since 2006. You have published a paper about “A Quaternary fault database for central Asia”. Tell us something about your work: What is the general context of this study? To calculate and map seismic hazard, it’s essential to know where the active faults are and how they behave. The Quaternary fault database for Central Asia improves access to this kind of information through a web-based interactive map and an online database with search capabilities that allow users to organize data by different fields. The database can be accessed here. It took about 2 years to build and populate the database. The work involved reviewing over 250 published papers and compiling three large sets of data: fault locations (~1196 traces of faults), fault attributes (for 123 faults) and seismicity (>34,000 earthquakes). But what you see on the site is subject to change based on community’s feedback. What was the main motivation for this work? The project was inspired by my interactions with the general public, their curiosity, and genuine concern for earthquakes. In Tübingen, Germany, I continue to make and take opportunities to interact with the public through events such as TEDx Stuttgart (e.g. How to disarm earthquakes) and by developing educational videos that can be shared globally (e.g., earthquake video library project). What is new with respect to previous similar studies? We have access to a large amount of data on active faulting in Central Asia, but these data are often documented in a wide range of formats (digital, text, maps, etc.) and published in non-open access journals. This makes data access and dissemination difficult especially for non-academic users and the general public. This project provides an open-access and searchable database that includes an interactive fault map. It allows users to run queries (e.g., what are the faults located near I live?) and access important fault parameters such as slip rates and earthquake history. What are your hopes for the impact that it might have on science/society in general? My hope is that local and intentional organizations working in Central Asia (especially those involved in development-related projects) consider fault location and parameters in their project analysis. What will be the next step in the project? The next steps may include: addition of new fault information (e.g., fault geometry, recurrence interval, slip/strain rate maps), as well as information from existing landslide and flood inventories for the region. We also hope to include geo-thermochronology data for catchment mass fluxes and fault offsets. You are last year’s EGU public Engagement Grant Awardee! — Can you tell us more about what you did with this grant? This grant has helped us produce 10 earthquake education videos covering topics that range from Earth’s interior and plate tectonics to liquefaction and structural hazards. These videos are designed to translate seemingly abstract or banal concepts into easily accessible, practical and potentially life-saving information. The production involved young scientists from several universities across the UK and Germany, and is endorsed by institutions such as the MIT BLOSSOMS, Teachers Without Borders, and Geology for Global Development. Most of these videos are currently available for viewing and download on the EGU Media channel– The remaining 2 are in production right now. Do you have tips for other ECS on how to turn their science useful to the public? Talk to the public and listen to their comments and questions, and take them seriously. Often, the public will tell you (or at least hint at) how you can make your work more relevant and useful to them. I’d suggest start with family members and friends and think twice about turning down a public speaking opportunity that you’ve been offered. As a conclusion, what was the most helpful advice you have ever got for your scientific work/career and who gave it to you? “Don’t kill or get killed” is a really important advice for those who work in remote and potentially dangerous parts of the world. Also “always save your data before you do anything else” because if you die, at least there’s a chance for someone else to use your data. Words of a role model, friend, colleague and an adviser. Thank you for the seismochat! Would you like to share the passion for your science in a seismochat? Contact us at ecs-sm@egu.eu. 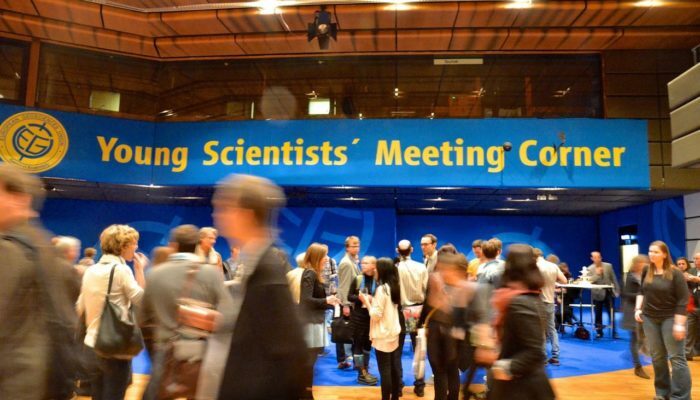 The EGU seismology division is looking to elect a new enthusiastic team of early career scientist (ECS) representatives from the beginning of May. If you are a PhD or Postdoc, why not consider taking up this role? Why should you consider becoming an ECS representative? Producing innovative science is the first and foremost task of any early career scientist. However, this work is embedded in the scientific community that shapes its course through conferences, workshops, and collaborations. If you are interested in contributing actively to a lively European seismology community, you should consider becoming an ECS rep. Besides the chance to be active in the Europe’s largest geoscience organization, being an ECS rep can be a great networking and team play experience. Depending on the activities you choose to undertake, it will broaden your scientific horizon, enable you to meet established scientists, or sharpen your science communication skills. Here you can find a description of the ECS role, and in this interview with Wouter Berghuijs, the union level ECS representative, you can read more about the importance of ECS reps.
What are typical tasks of the ECS representatives? Of course, each and every representative’s creative ideas are most welcome to extend this list. Will it affect your work? Especially PhD students may worry that the ECS role takes too much time away from their scientific work. This is one of the reasons that a team will be elected, so that work can be shared and the workload as ECS rep. becomes manageable. In past two years, we (the current ECS team) have experienced that working together also led to scientific discussions beyond each one’s own expertise, which greatly improved our individual knowledge and led to some unexpected scientific collaborations. So being a Seismology Division ECS representative even enriches your scientific work. Who can become an ECS rep? Anyone EGU member who is a PhD student or scientist who has received his or her highest degree (BSc, MSc, or PhD) within the past seven years (with possible extension for parental leave). How to become an ECS rep? The ECS reps will be elected at this year’s general assembly (8-13 April 2018). Personal presence at the conference is not a requirement, so don’t worry if you are not going to make it to Vienna. If you are interested in taking on this role, send an email with a short motivation statement and your CV to Martin Mai, the Seismology Division President: sm@egu.eu and Laura Parisi, current head of ECS team: ecs-sm[at]egu.eu. Don’t even hesitate to contact them with questions! Edited by ECS reps Laura Ermert, Laura Parisi and Koen Van Noten. You've met reviewer 3 yet? From http://jasonya.com/wp/tag/red-pen-black-pen/ with friendly permission from the artist. Have you ever wanted a reviewer who really tells it how it is? You should consider submitting a paper to the truly special publication ‘Frontiers for young minds’. Frontiers for young minds is a journal for students between ages 8 and 15 that are curious and passionate about science. However, what’s truly special about this journal is that it is also reviewed by students of the same age, assisted by a science mentor. The journal aims to communicate cutting edge science to young readers in a way that they find both understandable and interesting. Therefore, kids and teenage “young reviewers” are called upon to make sure that complex terms are explained or weeded out, basics are introduced at the beginning, and also that the article is an exciting read. In going through this process, the young reviewers are supposed to learn about science and the process of peer review, while the scientists who wrote the article receive feedback about their science communication skills and how much their science appeals to an open-minded lay public. At the same time, the journal is building up a collection of texts that can be used by science teachers and interested lay persons – and that are hopefully more exciting and up-to-date than many schoolbooks can ever aim to be. Many reviews are actually performed by school classes who work on it together as a project. The first articles were published in 2014; the journal is open-access and financially supported by the Jacobs foundation. This enables the journal to make submissions free for authors. Articles are subdivided into thematic groups. “Core concept” articles lay the foundation for young readers to understand the more current contributions, or “new discoveries”, based on recently published papers. The journal for kids is the junior branch of a “grown up” series of open access journals called Frontiers. Frontiers is itself a young publication series, having started out in 2007. While several frontiers journals such as Frontiers in Neuroscience are widely known and highly ranked among the open access journals of their respective fields, Frontiers in Earth Science, which started out in 2013, has published only about 250 articles so far, and has yet to be assigned an impact factor. Thus, it is not surprising that most articles featured in Frontiers for young minds come from the fields of neuroscience and other medical research fields. Still, the section ‘Understanding the Earth and its resources’ features articles relating to geoscience, in particular environmental science. 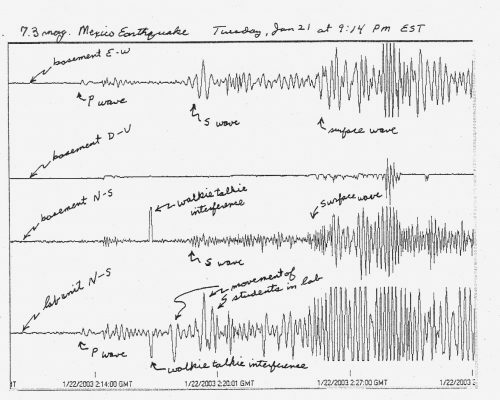 Who knows who will write and review the first contribution in seismology? While the idea behind the journal is great – imagine how excited you would have been as a kid if the editor of National Geographic wrote to you to ask your opinion on the latest article about Polar Bears? – it obviously also provides a convenient platform for Frontiers to raise their visibility with a new generation of authors and/or their scientist parents. 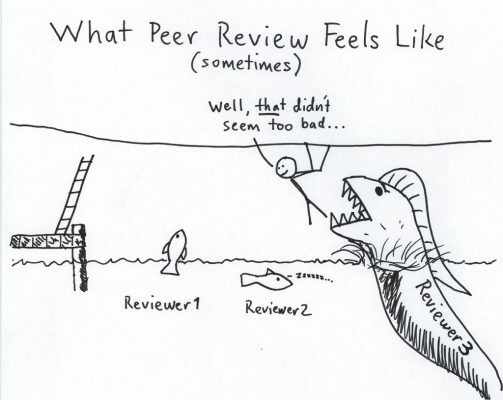 An open question for me is how well the young reviewers are made aware that peer review is not only a process that should embellish the language of articles and make them more readable, but is most importantly an instrument of critical and sometimes fierce scientific debate. It does not become quite clear either whether the young editors are granted the power to flatly reject a submission if they do not like it! We are excited to see who will be the first seismologist to brave the harsh review of a classroom full of nine-year-olds! You can have a look at the author guidelines here. Good luck! And let us know if you get published. Edited by ECS representatives Laura Ermert and Matthew Agius. Our paper of the month is “Signal apparition for simultaneous source wavefield separation” (J. Robertsson et al., 2016) commented by Andreas Fichtner. Andreas Fichtner is Assistant Professor for Computational Seismology at the Swiss Federal Institute of Technology (ETH) in Zurich. He received his PhD from the University of Munich for his work on Full Seismic Waveform Inversion for Structural and Source Parameters. During his postdoc at Utrecht University, Andreas worked on the development of resolution analysis and multi-scale methods for seismic waveform inversion. His research interests include the development and application of methods for full seismic waveform inversion, resolution analysis in tomography, earthquake source inversion, seismic interferometry, and inverse theory. For his work, Andreas received the Keiiti Aki Award 2011 from the American Geophysical Union and the Early Career Scientist Award from the International Union of Geodesy and Geophysics. In his paper of the month post, Andreas will present us a recently published paper by Robertsson et al. that describes a new approach to the magical art of source separation – or how to disentangle seismic signals from sources that acted at the same time! Sounds impossible? Not for an exploration geophysicist! “One of the most longstanding problems in exploration geophysics is the separation of two wavefields emitted by two different sources. Just imagine, for instance, that two sources are fired, emitting wavefields g(t) and h(t). A receiver records the sum of the wavefields, f(t)=g(t)+h(t). If one could separate g(t) and f(t) from their sum, the time needed for seismic acquisition could be reduced by 50 % because two sources could be fired simultaneously. This is just one of many possible applications of wavefield separation. While most previous research on wavefield separation focused on temporal encoding of sources, Robertsson and co-workers introduce an entirely new concept that is wonderfully simple and elegant. 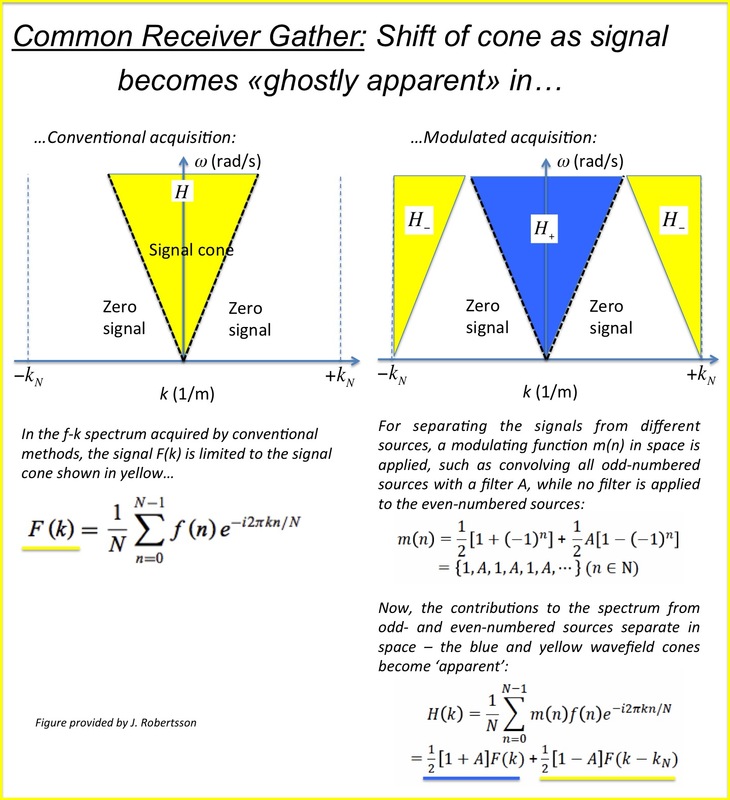 They start with the well-known observation that the f-k spectrum for a line of sources recorded at one receiver is restricted to a signal cone bounded by the slowest propagation speed of the medium, e.g. the propagation speed of water in a marine experiment. Thus, most of the f-k domain is empty. Now you do a little modification to the experiment. Instead of firing all sources along the line in exactly the same way – as is usually done – all odd-numbered sources are fired with some freely chosen modified source signature, such as a filter. Magically, the signal from this modified subset of sources appears in the previously empty part of the f-k domain. From there it can be extracted without any pollution by the even-numbered sources. This ‘becoming visible’ of a wavefield is referred to as ‘signal apparition’ by the authors of the paper. While the authors limit their examples to seismic acquisition along a 2D line, many other applications could be envisioned. They include, for instance, the numerical forward simulation of seismic waves from a large number of earthquakes, as needed in waveform tomography. Reference: Robertsson, J. O., Amundsen, L., & Pedersen, Å. S. (2016). Signal apparition for simultaneous source wavefield separation. Geophysical Journal International, 206(2), 1301-1305. Do you have questions, suggestions or comments? Please use the space below, or contact us on Facebook or Twitter @EGU_Seismo! Edited by ECS representatives Laura Ermert, Matthew Agius, Lucia Gualtieri and Laura Parisi.